Australian actress Katherine Langford who is best known for playing the main role of Hannah Baker in the 2017 Netflix series 13 Reasons Why. She received Golden Globe nomination for her role in 2018. She has starred as Leah Bruke in the romantic comedy-drama film Love, Simon. Katherine Langford was born on 29 April 1996, in Perth, Western Australia, Australia. Langford went to Penrhos College for her primary studies and St. Hilda School for her secondary education. She graduated from Perth Modern School in 2014, majoring in music and drama and then enrolled at the Principal Academy of Dance & Theatre Arts to study Music Theatre. She appeared in a production of Godspell there and apparently became one of the five selected participants in the National Institute of Dramatic Arts Advanced Actors Residency in 2015. She was given admission to Bachelor of Arts program in Acting at the Western Australian Academy of Performing Arts, but she never enrolled and instead pursued professional roles. 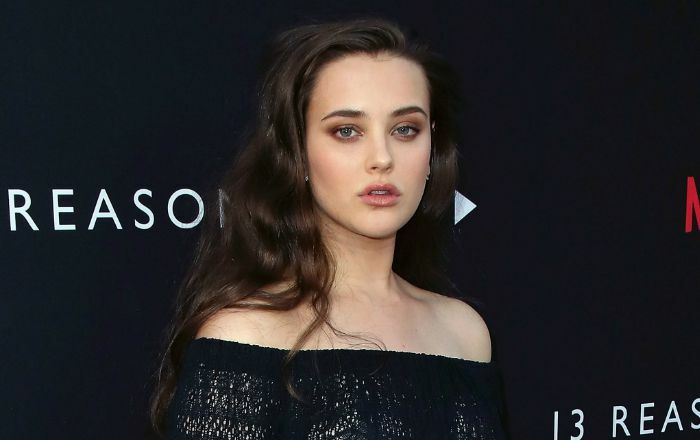 Katherine Langford has kept her personal life discreet from tabloids and thus there is not much information available of any relation she has had in the past or in the present. In 2018, Katherine was cast in the lead role of Vesna in the film The Miguided. Before that, she appeared in two short films in 2016. In 2017, she made her television debut appearing in a lead role on Netflix series 13 Reasons Why as Hannah Baker. Playing Hannah Baker in the 2017 Netflix series 13 Reasons Why, based on the novel of the same name, for which she received a Golden Globe Award nomination. Langford has a strict skincare regime and is very choosy about the products that she uses, when it comes to hair and makeup. She prefers to use these products which we’ve identified from her looks and style spotted at various events and award ceremonies. She uses Kat Von D’s Studded Kiss Lipstick which is infused with vitamins A, C, and E, an antioxidant complex that leaves lips feeling soft. Another product that she loves using is the Mac Lipstick that seals her lips with moisture. She uses Burt’s Bees 100% Natural Eye Shadow Palette that consists of Bamboo, Honey and Vitamin E to nourish skin for beautiful results inside and out it. It offers a natural, long-lasting, mineral eye makeup resists creasing, fading and smudging for all-day wear. She uses MAKE UP FOR EVER HD Microfinish Powder that softens the appearance of imperfections, fine lines, and pores and completely evens out the complexion for a glowing, radiant look. She has a total net worth of $4.5 million. She took voice lessons in 2005, and even attended classical, jazz, and contemporary vocal training. At high school, she was interested in medicine and politics. But after attended Lady Gaga’s concert, the Born This Way Ball at the age of 16, she was determined to become a performer. She even had piano lessons. Langford appeared in the school’s production of Hotel Sorrento in 2013. Langford gave audition for her role as Hannah Baker in the mystery teen drama TV series 13 Reasons Why on Skype. She had only 10 days to get an O-1 visa as she had not worked in the United States before. She was a national level swimmer during her school years. She had ever seen a snowfall until in 2016 in New York City, U.S.